Have you heard about Nextion Display? Nextion allows you to craft awesome interfaces, even if your coding level is "hello world!". And, Nextion works with Arduino and all versions of Raspberry Pi. In this tutorial you will learn how to add a Ubidots' buttons to your Nextion Display Interface. The logic behind activating a Ubidots button in your Nextion Display is quite simple. When the button is pressed, a variable in Ubidots changes. If the button is on, the variable will have the value of 1, else 0. We recommend following the guide How to setup the WiFi connection of your Raspberry Pi, and also learn how to connect to it through the SSH terminal. Download the Ubidots Nextion file. Copy the file named Nextion.HMI to the micro SD card. (The memory must not contain any other files and must be formatted to FAT32). Good. Put the micro SD card inside the Nextion micro SD port. Connect the Nextion display to the Raspberry Pi. 7. Turn on your Raspberry Pi and wait a few minutes until it boots up. 1. Connect to the Raspberry through SSH. 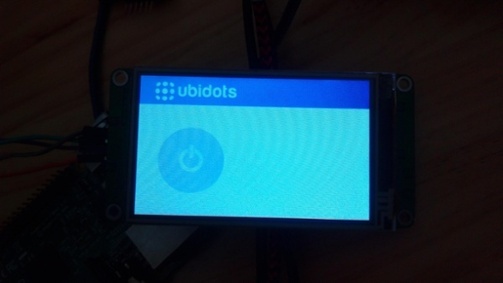 Now we are done with the configuration needed to connect the display to the Ubidots cloud. Create a python file named "display.py". Copy and paste the code (we are almost finished, don't worry =D). Change the TOKEN, the variable label and the device label to match your device and the variable you want to control using the button. See here to find your variable and token. Run the python script and you are done. Share your results with us in our IoT developers community. Here you can also find helpful hits and other great IoT projects to deploy today. This content was originally published in Ubidots' Blog on November 11, 2014.